Steel plate engraving and Biography from The Documentary History of the State of New-York; Arranged under Direction of the Hon. Christopher Morgan, Secretary of State. By E. B. O'Callaghan, M.D., Vol. III, Weed, Parsons & Co., Public Printers, 1850. 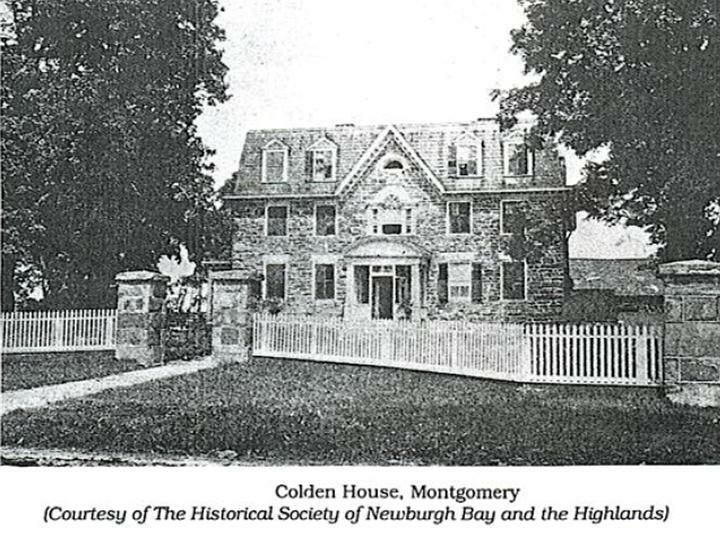 "The Colden Mansion is now an official landmark. "On Thursday, the Montgomery Town Board Unanimously granted status to the eight-acre property under provisions of Local Law 1 of 1997. "In essence, the board's decision enables the town's historic preservation commission to review any action which would alter the Route 17K/Stone Castle Road site. "In other parts of [the] world, people wouldn't even hesitate if given a chance to preserve such a site," said Richard Phelps during the public hearing. The stonework to this day, is of remarkable quality. "The local designation was significant in that it was the first site to receive it without achieving prior placement on the state and/or national registers. "Although the public hearing was on the issue of designation, some residents used the forum to express fears or support of the towns possible acquisition of the site. "With very minimal effort, I have seen other similar projects become significant tourist draws," said Mike Clark. ""Given the historic identity of the Colden family, I believe this will be the case here." ""I can't understand why anybody would want to put so much money into that site?," said Fred Freer. We could spend our money on a lot more sensible things. "Currently, there are about a dozen town designated sites. Indian Hill, which is located off River Road, was added to [the] list along with the Colden Mansion. "With the designation decision, town board discussions regarding the mansion site are expected to subside. The following is a summary of events which may lead to the town's acquisition of the site later this year. "1767-- The mansion is constructed for Cadwallader Colden Jr. and his wife, Elizabeth Ellison. Considered one of the area's finest Georgian homes, the two story stone structure rests upon the family's approximately 3,000-acre holding. It features two bedrooms, two parlors, a large central hall, and a basement kitchen. "November 23, 1999--Local officials announce the state's intent to acquire the site, which is draped in dense vegetation and household trash, and transfer it to the town. The move is prompted by the state's proposed construction of an I-84 interchange. State officials worry that development triggered by a new interchange, would threaten the site. "December 20, 1999-High-level representatives of the state Office of Parks, Recreation and Historic Preservation publicly detail plans for the proposed acquisition. They say the total cost for acquiring the site would be incurred by the state Department of Transportation. 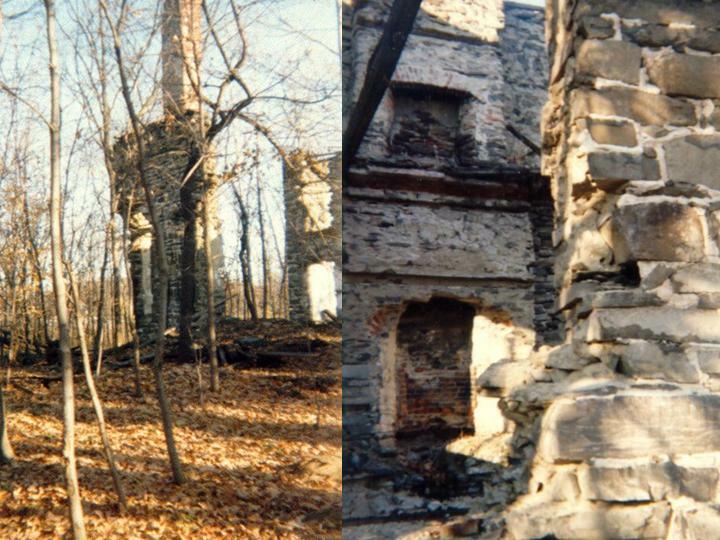 However, once conveyed, OPRHP officials noted that the town would have to preserve the site as a "scenic and historic resource" via a stabilization effort. Such an undertaking would be eligible for grant opportunities, they stressed, with the DOT's expenses used as the town's matching funds. "In a somewhat unrelated move, the town board votes to hold a Jan 6 public hearing in regards to the designation of the site as a town landmark. "December 30, 1999--The town board unanimously adopts a resolution supporting the state's proposed acquisition. However the town clearly states its oppositions to any expenses for items outside of future routine maintenance or grant-related engineering studies. "January 6--The town board unanimously adopts a resolution granting the Colden site Town of Montgomery Historic Designation. In essence, the board's move means the site cannot be tampered with unless reviewed and approved by the town's historic preservation committee." 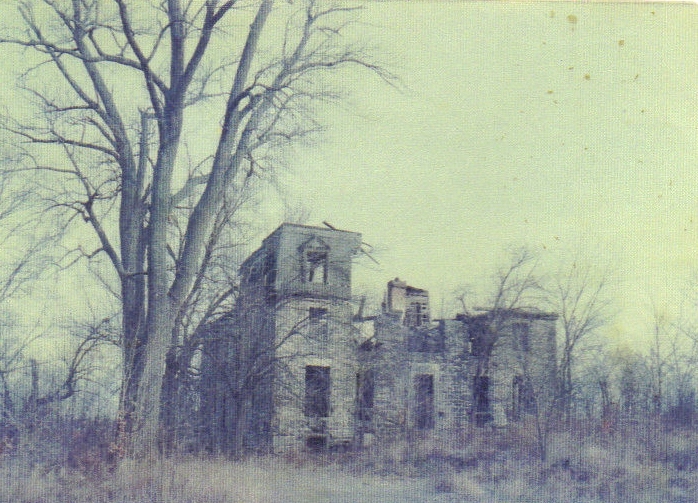 Before falling to ruin as pictured on page 51 of the book, Concise History of Orange County, by Reverend A. E. Corning, 1946. The date of the picture isn't listed. The area known today as Coldenham, New York. A portion of the stone walls still stand near the intersection of 17K and Stone Castle Road. "The Verplanck Room comprises elements from two sources: a collection of furniture and other objects that belonged to Samuel Verplanck (1739-1820) and a room from the house of Cadwallader Colden Jr. (1721-1797) in Orange County, New York. Both the Verplancks and the Coldens were prominent families in eighteenth-century New York, though the Verplanck residence was more ornate than that of the Coldens. The marriage of elements from the two homes has allowed the Museum to represent the Verplanck furniture in a context generally fitting its date and location. 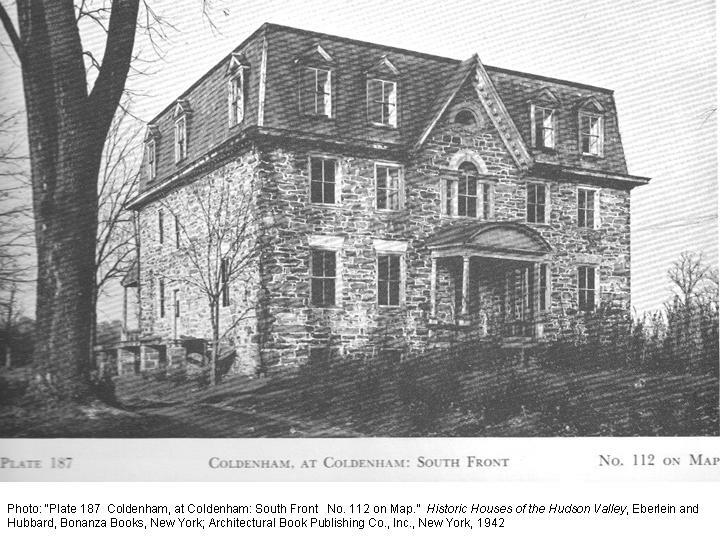 "The Colden house was built in 1767 on a three-thousand-acre family farm in Coldenham, New York. 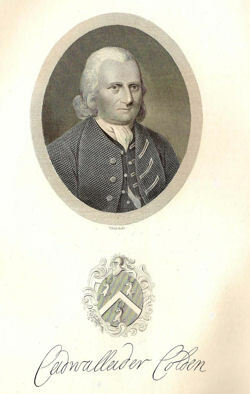 Cadwallader Colden Sr., a noted scientist and the lieutenant governor of New York State from 1761 until his death in 1776, gave his son the title to five hundred acres of the family farm in 1744. 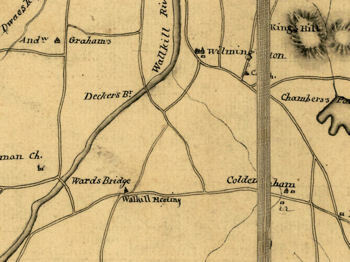 In 1767 the young Cadwallader built two houses on the land. The Museum acquired woodwork from one of these homes in 1940. The earliest surviving image of the house is an engraving of 1859 (shown above [at the Metropolitan link above]). The image reveals that the original stone house was two and one half stories high and five bays wide. The first floor consisted of two parlors, one on each side of the central hall. There were two chambers above the parlors and a basement kitchen below the east parlor. The paneling installed in the Museum's Verplanck Room came from the west parlor." (Source: website from the Metropolitan Museum in New York City) Another Metropolitan Museum view of the Verplank Room.